Hello, my name is Sara and I write the blog a dose of pretty. here sharing a bit about motherhood and my family. Just two months ago we were a family of three. And now there is four of us. I gave birth to Ella Sofia on June 3, 2012.
job and the hardest. I love being a mom. It's the best feeling in the world. I know this is so cliche, but I am struggling finding the words to describe the feeling. the lived-in look with toys. I have learned that baskets are a mom's best friend. a glass of wine with the hubby without the evidence of toys staring at us. Thanks Natasha for having me over. I just linked up the post from my blog. I hope you are having a great day today. 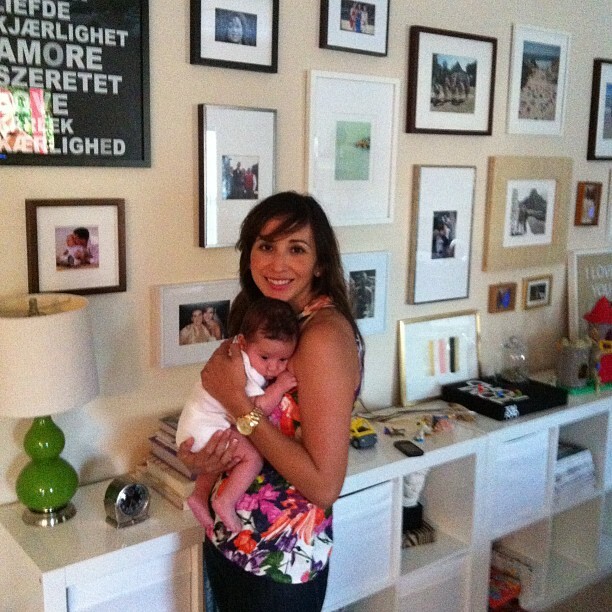 Ah congrats sweet Sara, love Ella's sweet little name! I am learning to adjust to toys as well. Slowly our basket population is growing. Congrats! Beautiful. We are a family of 3 too... well 4 really because Sadie is growing right now. She is due late Oct. I can't wait, but I can wait! Much to prepare!? Advice? I love baskets too. Although my husband switched us to bins so we can "put a lid on the toys / get rid of what doesn't fit." It drives him nuts!